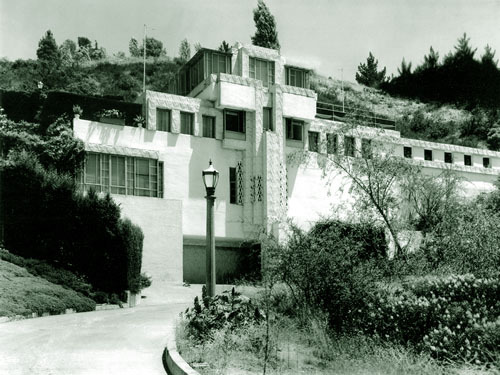 Samuel-Novarro House in the Los Feliz Hills: Silent era star Ramon Novarro was its first resident. Designed by Lloyd Wright (that's Frank Lloyd Wright's son) in the late 1920s for MGM star Ramon Novarro's then personal secretary, Louis Samuel, the unusual residence known as the Samuel-Novarro House is located in the Oaks neighborhood of the Los Feliz Hills, the eastern section of the Hollywood Hills. The Samuel-Novarro House was initially supposed to have been a small one-bedroom dwelling for Samuel – Novarro's intimate companion in the late 1910s – but the layout was considerably expanded following Samuel's marriage in 1929. In order to help pay for the mortgage, Samuel, relying on the assistance of an investor brother, embezzled money from Novarro's holdings to gamble in the stock market. The market crash in late 1929 and the bear market that followed throughout much of 1930 wiped out Samuel's investments. Despite being devastated by Samuel's betrayal, Novarro, who had been left with $160 on his bank account, opted not to press charges. The star of Ben-Hur and The Student Prince in Old Heidelberg was then at the height of his fame. Musicals were in vogue at the dawn of the talkie era, and Novarro had a pleasant singing voice; the last thing he needed was a potentially career-damaging scandal. On the outside, the [Verde] Oak house was an imposing structure. Located on a slope overlooking one of the Hollywood Hills canyons, it extended from its lower level on [Valley] Oak Road to its uppermost level and main gateway on [Verde] Oak. The outside walls were white concrete partially shielded by patterned copper bands reminiscent of Mesoamerican temples, with a hollow block within the reinforced concrete that theoretically made the house earthquake-proof. From the gateway, a flight of Nile green steps led down the terraced gardens to a blue-toned guest room immediately above the main house, which could be reached by a further staircase. With the assistance of MGM art director Cedric Gibbons, Novarro devised the modernistic (and gaudy) interior, most of it furnished with pieces from the luxurious Bullock's Wilshire. The centrally located beige library boasted a panoramic view of the canyons and was used as a drawing room for cocktails served on metal tables set before futuristic loungers. 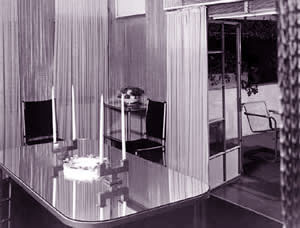 The dining room, on a slightly lower level to one side of the library, had black walls which set off strands of dull silver chains; the dining table was of frosted metal with a black satin cover, an onyx-glass tabletop, and aluminum legs. To the other side of the library was the bedroom, with pale green walls and dark green furniture that included a built-in dressing table and desk. At the end of the room, French doors opened to a swimming pool lined with Nile green tiles and surrounded by white concrete walls. The music room, where Novarro sang accompanied by friends at the piano, was underneath the dining room. Dull gold and bronze furniture and walls were covered by a rose brocade with a design akin to the copper motif found on the outside walls. This color scheme was contrasted by the whiteness of a polar bear rug and several light-colored pieces of woodwork. Adjoining the music room was a cocktail bar, and on the same floor, but reached through a separate entrance, were the servant's quarters and a passage leading down to the garage. Novarro would sell the house in late 1938, when he traded it for several lots in the San Fernando Valley. In 1944, Leonard Bernstein, Jerome Robbins, Betty Comden, and Adolph Green rented the Los Feliz Hills house, where they worked on the Broadway musical On the Town. Thirty years later, on July 17, 1974, the Los Angeles Cultural Heritage Board declared the house a historic-cultural monument. It became officially known as the Samuel-Novarro House. In the early 1990s, architect Josh Schweitzer extensively renovated the place for Diane Keaton. She sold it in mid-decade. The current (March 2006) price tag for the three-bedroom, three-bathroom Samuel-Novarro House is US$3.1 million. The seller is actress Christina Ricci. One of my favorite homes, I can even live with the Cross effect. beautiful in every way, see tribute to Ramon Novarro for February 7th Birthday! There is a cover in a 1994 Oscar edition of Architectural Digest about this home. It is where I first learned of it, and Ramon Navarro. I'd love to have it now as much as then. I WANT THIS HOUSE IT IS SO AMAZING !!! ? My family owned 2219 Verde oak Drive from 1962 till 2001. I spent quite a bit of time in the beautiful Novarro House as I grew up with this house being the house next door to ours as you went down Valley Oak or up Verde Oak. Which brings me to one small tid bit in your description of the home which is quite incorrect. The Verde Oak entrance to the home is the “upper level” entrance to the home as Verde Oak goes uphill to a higher elevation than does Valley Oak which leads downhill to the lower level of the home where you see the garage entrance and the door to the right of it which is an enclosed staircase leading to the upper levels of the house. I watched this home go through a lot of changes in the decades my family lived beside this wonderful home. I am available via e-mail should I be able to in anyway add to the known history of this house. Thank you for writing. I drove through there a number of times while working on the Novarro book (coincidentally, the paperback edition of “Beyond Paradise” came out today!). I can't believe that I somehow switched the two street names around when it came down to writing that paragraph. But I just checked this Google map of the Los Feliz Hills, and of course, you're right. Thanks again for writing. Wish I'd shown you that bit from my Ramon Novarro manuscript eight years ago. im breathless……..its so unique, amazing, and UNBELIEVABLE! !